Sneaking up more veggies on my kids is part of my job as a mom. I do it with glee and satisfaction. What they don't know might help them. This is my motto when it comes what I like to call: Stealth Veggies. It's also a good way to keep your budget reasonable while feeding you children nutritious food. I almost NEVER make a pasta sauce without a healthy serving of stealth veggies. I use my amazing little food chopper to make this possible. The vegetables are cut up so finely, that they blend right in with the consistency of the ground meat in my spaghetti sauce, and my little picky eaters never know the difference. The start of this sauce may be different today than other days for me, and for you as well. I start off with about a pound of ground meat, 1 medium finely chopped onion, and 2-4 C of finely chopped assorted veggies. Favorites for spaghetti sauce are carrots, zucchini, and occasionally bell peppers. Now, this time, I had some gorgeous Italian chicken sausage as my meat, and it is so lean that you'll see I had to add 1-2 T olive oil to help it all sauté without sticking. If you're using 93% lean ground beef, I'd just add the meat and the veggies and sauté without oil, and without rinsing and draining. If you have any higher fat content on your meat, I'd cook the onions and ground beef together, then drain the fat, and then add the other veggies, or your sauce will be really greasy and high in fat. Anyway, I sautéed the sausage and veggies together until the sausage was cooked through. You can see how adding in the chopped veggies can really expand your meat. The finished sauce was about four quarts. Enough to feed our family of four for four different meals. This sauce freezes really well. When the meat was cooked, I added 2 15 oz cans of diced tomatoes. I puréed both in the blender, since my kids aren't big fans of chunks of cooked tomatoes. Sometimes I purée one, and leave the other for more texture. This is the point when I realized my error in starting in the large skillet, and transferred to my 6 quart stock pot. Too much sauce! After adding the tomatoes, I began adding spices. Seriously, the giant canister of minced garlic... one of my best culinary friends. I allowed the whole thing to simmer for about 30-45 more minutes, getting nice and thick, and wonderful, before adding 8 oz of fresh quartered mushrooms right near the end. These are optional, but so delicious. If your family can handle the chunky texture, I also love to throw in some more coarsely cubed or diced or sliced zucchini at this point. I then added 2 cans of tomato paste and 2 cans of water, and 1 large can or bottle of pre-prepared spaghetti sauce. I use Hunts, because it is the cheapest. Serve over whole wheat spaghetti, top with parmesan cheese, and enjoy! Sauté meat, onions, veggies, and oil until meat is cooked through. Add 2 15 oz cans diced tomatoes (puréed if preferred). Add all spices. Simmer 30-45 minutes, stirring occasionally until water is reduced, and sauce is thickened. Add mushrooms. Add tomato paste, water, and spaghetti sauce, simmering and stirring until well combined. Serve over whole wheat pasta and enjoy. Sauce freezes well, as long as you don't mix it with noodles. Cook fresh noodles, and thaw out sauce, and serve. 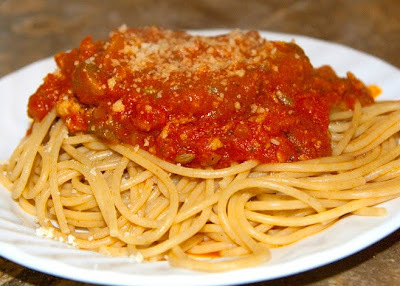 Who does not like spaghetti? This looks really delicious. Thank you for sharing lip smacking recipe. I cannot wait to try it out. Keep posting.